April 18, 2018, 9:45 a.m.
By Christine Schmidt @newsbyschmidt April 18, 2018, 9:45 a.m.
COPENHAGEN — In a land fraught with tension over an increasingly authoritarian government that’s attacking press freedom — not to mention Russia next door — this news organization is zeroing in on subscriptions and bolstering its network of local outlets. It’s Gazeta Wyborcza, the leading Polish newspaper, and its online strategy is spearheaded by Danuta Breguła. Gazeta Wyborcza grew out of the Solidarity movement and, when launched in 1989, was the first paper since the start of the communist regime to be published legally without government control. It has long been known for aggressive, public-minded journalism, leading campaigns against social ills. Nineteen percent of Poles visit Gazeta Wyborcza’s site weekly, according to the 2017 Reuters Institute Digital News Report. The right-wing Law and Justice government has taken an aggressive stance toward the media, including fining the country’s largest private TV channel 1.5 million zlotys (US $420,000) in December for its coverage of anti-government demonstrations. Despite those actions, 53 percent of Polish respondents to the Reuters survey said they trust news overall; 16 percent said they pay for online news. And Gazeta Wyborcza has been gaining traction across the country, having 133,000 digital subscribers by the end of 2017. During last summer’s political protests, its subscription sales increased by 900 percent, according to a presentation by Breguła at WAN-IFRA’s Digital Media Europe Summit in Copenhagen last week. Gazeta Wyborcza has also been increasing its local engagement, with 24 outlets focused on communities throughout Poland staffed with between 10 and 40 people each. Breguła’s team has been experimenting to figure out how to seize the potential of that local content. After her presentation, Breguła talked with me about her progress in strengthening local outlets, methods for improving subscription offerings, the upcoming elections in Poland, and her upcoming participation in the Poynter Women’s Leadership Academy. This transcript of our conversation has been edited for length and clarity. Christine Schmidt: In your presentation, you focused on how you have been able to put more emphasis on of local editions and their coverage. Can you explain to me the structure for the local newsrooms and the national organization of Gazeta Wyborcza as well? Danuta Bregula: Gazeta Wyborcza was founded as a nationwide newspaper in Warsaw, but after several years of very fast growth, the managers decided that they should launch some local newsrooms. There are 24 of them. In the print era, most of them were just additions to the print newspaper and differed from city to city. Then when advertising revenue started going down, some of them became four or three or two of the last pages of the national newspaper. They’re quite independent; they vary from one city to another because those communities are different; those societies are different. Poland was divided into so many parts for so many years that those regions are still different. We have cities that are a great group of middle-class people that need this premium content and we have some cities in eastern Poland where readership is smaller but even probably more important, as we’re living at the border of the European Union next to our great neighbor Russia. People need us. When we started our journey with paid content, we didn’t have any benchmark in Poland. All the know-how that was available was coming from the big American brands or some European brands that were just at their start. Nobody was talking about local content, so we really ignored that potential in the beginning. We weren’t really working with local editors on the paid content strategy. We’ve changed this over the last years. It’s really working because we matter enough to have our own strategy, not a copy of any other. We’ve gotten to know what’s premium, and it’s really different from what we thought. For local content, the value is when something is really useful and helps in your day-to-day life. How to get from point A to B, or how to find a school for your child — that’s enough. Our biggest mistake in the beginning was that we were looking for great stories on the local level. Incredible crime stories are opportunities for our investigative journalists to find an amazing story, but they do not happen every day. That’s more important when you’re in this paid content business, because there is a direct link between usage of subscription and risk of churn. Schmidt: Your team recently announced that you had increased subscriptions to 133,000. People who subscribe are signing up for all of Wyborcza, but do you know what role the local editions played in that number? Bregula: We know that local content convinced some users to the final decision to buy a subscription. Around 20 percent of transactions come from local content. It used to be 2 percent. Local content is 50 percent of our traffic. I’m sure it won’t convert as perfectly as the best investigative journalist story, but I think sure there’s a local moment. We used to make a lot of effort to evangelize our central newsroom and we didn’t really do the same work with our local newsrooms, but we are changing that in the last few months. Schmidt: What do you mean by that? Bregula: It’s a bunch of different things. The first is day-to-day work, explaining what has just happened, how the particular editors or journalists’ stories contributed to success or not, if we’d wasted the opportunity to reach the potential audience. The second thing is the local newsrooms weren’t using the analytical tools that I showed during the presentation for a long time. The third thing is their focus was still on building traffic for advertising for a long time. But on the other hand, for the paid content strategy, they could feel they were a bit abandoned. So last year, my friends and I started a tour around Poland visiting some of the biggest regional editions, and right now we’re establishing some dedicated channels to get in touch with them. We also have a person now that is directly responsible for communication related to subscriptions and current digital strategy with our local newsrooms. He’s also working on the greater presence of that local content around our whole inventory. Schmidt: During the presentation you mentioned an internal debate about giving up on monetizing local through a paywall. What argument did you make? Bregula: Most of the publishers sometimes get really frustrated with those initial results. Those local editions are really time-consuming and expensive and so on. There were some incentives to drop the paywall and offer them for free and use them to change our model from metered to freemium. Of course, in this model our local content would be the one to attract the audience. That would say that we don’t really appreciate this content and I don’t think that’s acceptable, especially when you think about those really talented journalists doing a really good job covering the daily life of Polish people. Sometimes it’s more relevant than covering politicians. I really think of our local newsrooms and our local journalists as a link between our newsroom and society. We have also this cool initiative coming from my publisher to look for young talented women across Poland to contribute to our section that is devoted to women’s issues, because we feel that we also need some local perspectives. Things look different from Warsaw in smaller cities, especially when it comes to bringing up children or looking for a job and trying to play all the roles and so on. Schmidt: How have the different subscription offerings or the benefits of the subscriptions changed over time? Subscribers are also getting editorial newsletters written by our best writers and editors. Some of them are occasional, some of them are regular. They are getting some content early or they’re getting some “making-ofs” or some commentaries that won’t ever be published on the website. Right now, we’re in the testing phase, but soon they will be able to use an ad blocker. Since they’re already paying money, we don’t want to force them to consume ads if they don’t want to. Schmidt Will that significantly affect advertising revenue or is that not as much of a priority anymore? Bregula: The revenue, whatever the source, is still very important. But we want to serve them better ads, a better user experience, some special offers from our partners rather than just display advertising or especially programmatic advertising that we don’t have any control over. We really think we can offer brand safety. We won’t offer a very big scale to our advertising partners, but what we can give is high viewability of those ads and brand safety, that’s for sure. The second thing is the quality of our subscriber. He’s engaged and really reading. What we can offer is that he has more contact with the ads. So this is what we’re working on right now. Our subscribers are also free to read some of our archives, which is around 4 million articles from the last 30 years. So they’re free to read 20 articles per month from those archives. But we knew that the access is not enough, so we launched something a like digital magazine called Wyborcza Classic. Two of our best colleagues are looking for the best stories from the 1990s or the last 15 years and bringing them to light. It turns out those articles do sometimes such a good job they’re evergreens and convert better than current news. Schmidt: Out of the different offerings that you have for subscription, from the newsletter to the subscriber-only comments and everything in between, do you see particularly high engagement for one that really converts subscribers? Bregula: The editorial newsletters are really engaging and I think 60 percent of the people that subscribe to the editorial newsletter actually read almost every email that we’re sending. We’re really happy with that. Our best email piece is an evening editorial newsletter and the engagement is incredible. The official evening email is the newsletter of [national] Gazeta Wyborcza. Right now we’re working on a newsletter devoted to bike routes in one particular region. We don’t want to be so directly linked to the old-school structure of the newspaper where you had the culture section and the health section and foreign affairs and local editions. We try to think about our subscribers holistically so we look for their interests and if we find somebody in the newsrooms that is really into some topic, then we let them prepare such a newsletter. Schmidt: How is Gazeta Wyborcza preparing for the Polish elections in October? Bregula: You know our current government, a right-wing government, is constantly trying to change the Constitution so that it would be harder for the opposition to even try to get to power. This is similar to what is happening in Hungary right now. These elections will show if this right-wing wave of sentiments is something temporary or are we going to stay with it longer. This is really important for our readers. Other media don’t really have those local newsrooms, so business-wise this is a great chance for us. Schmidt: Are you taking any particular steps to cover the elections in a different way? Bregula: The coverage of the election events will be digitally focused in the local newsrooms. I’m sure they will use a lot of video content. I think they will also do explainers. I think this is really important right now, when the results of the campaign will be affected by social media and some populist propaganda for sure. This is a great challenge for our local newsrooms. That’s where the real politics is happening. Right now, in most of the big cities in Poland, it’s the opposition that is ruling, so if the party in charge wins the election, that will mean they have control over the whole country and this might turn out to be a challenging time for our democracy. But we feel that our society is waking up. One of the hottest topics that is bringing people on the streets is the fight for women’s rights. Our government for the last two years is pushing the complete ban on abortion, similar to the law in Ireland. People are really, really engaged in those protests. Three weeks ago, we had 60,000 people protesting in the streets. I think it’s a great challenge for us to provide these people with some basic knowledge of what’s going on around them. Schmidt: Has Facebook been a major tool in Gazeta Wyborcza’s subscription growth? Bregula: Yes, but the publishers here are frustrated with Facebook and with the price they need to pay for the traffic coming from Facebook and the traffic going down. For us it’s different, because we decided over a year ago that we don’t need such traffic as when we were dependent on advertising only. It is not really bringing us any value. We completely changed the KPIs for our activities on Facebook. The main reason to be present on Facebook is to acquire and engage subscribers and three people were working on the system of our paid marketing campaigns. Those campaigns were focused on promoting content, not the subscription itself. But those campaigns were really cost-effective in the end. We’re really fine. It’s just about changing the priorities. When you don’t really look for the huge traffic from Facebook and you just decide to use it according to your priorities, then it’s fine. Still, I think that our main challenge right now is to create and develop our own channels, not to be dependent on such platforms. But we’re really interested in Google’s initiatives right now. Schmidt: What about Google’s initiatives appeal to you? 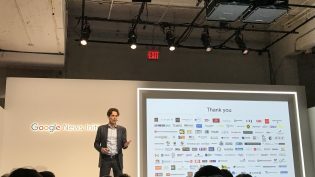 Bregula: We got the Google Digital News Initiative grant four times, and every time, the final product was a success. One of them was called Sonar, a fact-checking tool that allowed our users to follow politicians and compare their programs and activities. It’s working very well. It also allowed us to develop some very useful tools for visual storytelling. My company also won this grant for another app called Microphone that allowed people and reporters to deliver coverage from the streets to the main radio newsroom. Right now, we’re applying for something more focused on revenue. Schmidt: You were recently accepted to Poynter’s Women’s Leadership Academy. What are you hoping to get out of that? What skills do you want to build to bring back to your organization? Bregula: When you get a job and you’re good at a job and you’re getting promotions quickly, all you have to rely on is your intuition, and sometimes it’s not enough. I think women don’t get enough support and so many of them are following the managing style of their male colleagues. But anything that can help to develop your leadership skills is really useful. Women’s perspectives are very fresh but they are often not really heard within the organizations. Schmidt: Is there anything else you’d like to add? Bregula: Gazeta Wyborcza is really ambitious, and I think it’s the political situation that is making us so motivated. We’re speeding up some processes that may take much more time in other organizations across Europe. But we’re trying to see the bright side of that. 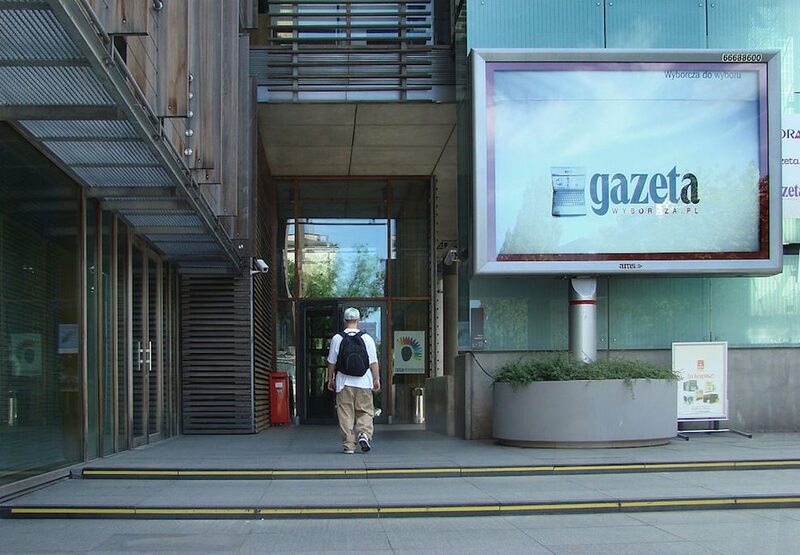 Image of Gazeta Wyborcza’s entrance in Warsaw by Szczebrzeszynski used under a Creative Commons license. POSTED April 18, 2018, 9:45 a.m.
Schmidt, Christine. "Facing government pressure, this Polish news organization is zipping through its subscription goals and strengthening its local loyalty." Nieman Journalism Lab. Nieman Foundation for Journalism at Harvard, 18 Apr. 2018. Web. 18 Apr. 2019. Schmidt, Christine. "Facing government pressure, this Polish news organization is zipping through its subscription goals and strengthening its local loyalty." Nieman Journalism Lab. Last modified April 18, 2018. Accessed April 18, 2019. https://www.niemanlab.org/2018/04/facing-government-pressure-this-polish-news-organization-is-zipping-through-its-subscription-goals-and-strengthening-its-local-loyalty/.